In high-temperature metal joining processes (welding, brazing and soldering), the primary purpose of flux is to prevent oxidation of the materials being joined. It essentially cleans and prepares the surface to allow proper joints. In electronics work and similar fields, flux can be found inside the solder wire itself. And it is also available in liquid, spray, paste, or pen form. No clean fluxes are somewhat weak, but the benefit is that what little (if any) residue left behind will not harm or corrode your devices. No-clean fluxes are great for production environments, where the substrate (pc board) and component or wire lead are fresh, clean, and not oxidized. Choices for liquid flux in the Kester product line include Kester 951 and Kester 959T. There are many options for no-clean flux cored wire such as Kester 245. Specialty paste or "tacky" fluxes are used for holding components in place during rework. Kester RF741 is an excellent product for this application. RMA fluxes have a bit more strength than no-clean formulas, but they will leave a non-corrosive/non-conductive residue. Often this is a light yellow sticky goo. This residue does not need to be removed for most applications, it depends on the exact chemistry and the sensitivity of the component. These fluxes are a great choice for repair and rework applications, or for hobby use. RMA liquid fluxes from Kester include Kester 186. 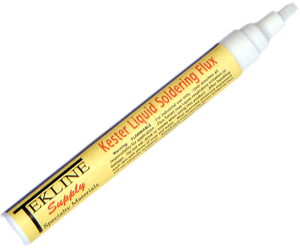 Flux-core wire solders include the legendary Kester "44", arguably one of the best all-purpose electronics solders ever produced. Activated Rosin have much more strength than No-clean or RMA fluxes, but they will leave a residue that may need to be removed. This residue may be corrosive, check the manufacturer's data sheet. The added power in the activated rosin can remove oxides that no-clean and mildly activated fluxes cannot. Choices in the Kester product line include Kester 1544 liquid flux. Inorganic "acid" flux is very strong, and perfect for difficult to solder metals. This can be helpful for heavily oxidized metals, or for materials that have a low solderability. However- a corrosive residue IS left behind, so a rinse via hot water wash or solvent is required. Water Soluble fluxes are formulated to be easily washed off, especially in process after wave soldering. They are corrosive, and will corrode the surface if let on the board. This type of flux is typically used in a production environment, and less likely in repair/rework applications. Water Soluble products from Kester include Kester 331 flux cored wire.